Even with so few ingredients, this was tasty. My pasta was a little drier perhaps than I would have liked, but I actually think it had more to do with the fact that I ended up using whole grain pasta than any other reason. 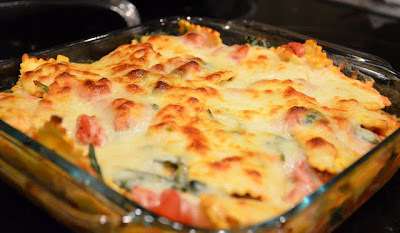 Without a true sauce, this will cool quickly, so warm your serving bowl in the oven or pour hot water into it (but dump it out before you put the pasta in ;)) to keep it warm until you’re done with it! Bring a large pot of water to a boil over high heat. When it boils, add a tablespoon of salt and the pasta. Cook according to the package directions. Drain, reserving about a cup of the pasta cooking water. Meanwhile, heat a 12-inch not-nonstick skillet over medium heat. Add the nuts; cook and stir until fragrant and lightly toasted, 1-2 minutes. Transfer to nuts to a small bowl; set aside. Add the fat to the now-empty skillet and heat over medium heat. Add the Brussels sprouts and a big pinch of salt; cook without stirring for 2 minutes. Stir; repeat the cooking for another 2 minutes or slightly longer depending on your desired level of “doneness”. Push the sprouts to the edge of the pan and add the garlic and pepper flakes to the cleared center; cook and stir constantly until fragrant, about 30 seconds. Stir into the sprouts. Add the water to the pan; immediately cover and continue cooking for 2 minutes. Remove the lid, scrape up any browned bits on the bottom of the pan, and let any remaining liquid evaporate. Add the drained pasta, Brussels sprouts mixture, lemon juice, and ½ cup of pasta cooking water to the pot the pasta was cooked in. Stirring continuously, sprinkle the parmesan over the pasta, adding more pasta cooking water if necessary to keep the mixture from drying out. Adjust the seasoning with salt and pepper if necessary; serve immediately, preferably in warmed bowls. I first made this dish back in high school, and my mom loved it. It’s since become her frequently requested item for special events, so when I wanted to hold a little birthday dinner for her when she came to visit this was the first thing that came to mind. It’s tasty AND easy! The hardest thing is chopping up the vegetables, which I didn’t even do that great of a job, leaving the peppers too thick this time around. 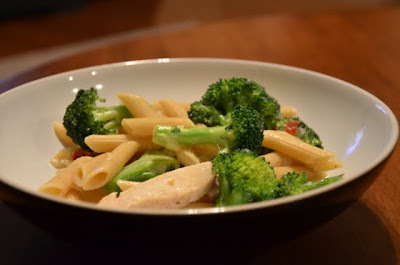 Nevertheless, this dish can also be known as winner winner (literally) chicken and pasta dinner. While cooking the pasta, melt the butter in a 12-inch skillet over medium-high heat. Add the chicken strips, stirring constantly, until lightly browned (about 4-5 minutes). Stir in the onion and peppers, and continue stirring until the chicken is no longer pink and is cooked through (6-8 minutes). Add the cooked pasta, cilantro, pesto, and olives if using to the skillet, and continue cooking until heated through (1-2 minutes). Serve with Parmesan cheese. Corrie loved this. I thought between the salt I added and the fact that I put too much cheese on everything that it was a little salty; however, it was still really good, and I would make it again either controlling my portion of feta or salt (we all know in my case it will be the salt! ).